Where Do Boys Belong In Women’s History Month? I entered the education field to broaden the minds of a new generation and teach the truths that I felt I had missed or was denied in my own education. Indeed, I was not alone in those motivations. According to the Primary Sources project by Scholastic and the Bill & Melinda Gates Foundation, of the more than 20,000 public school classroom teachers polled, 85% of teachers say they chose the profession in order to make a difference in children’s lives. Despite my righteous ambitions, once in the classroom, I was hesitant to broach the conversation about gender with a mixed class of boys and girls. So many of my own college classes that focused on social justice and equality issues were almost entirely women. Acutely aware of my students’ fragile perception of themselves, I was intimidated by the prospect of guiding the discussion. When I was leading a classroom of my own, it was often easier to concentrate on the benign world of synonyms, dictionary skills, main idea, and genre features than push my students to think about what role gender plays in achievement, history, and identity. I wondered: How do we teach about women’s history and contributions without alienating boys? Will boys disengage if a girl or woman is on the cover or is the main character? In this day and age, do girls still need explicit attention drawn to high-achievers that share their gender? Leading up to my first month of March as a teacher, I thought I would “just” read more books with women as the central figures during Women’s History Month, but not explicitly point out that these were all women so as not to freak out boys and hope the girls would pick up on my subliminal messages of empowerment…. This thinking was a huge disservice to ALL of my students’ educations. As I introduced books with prominent women historic figures or girl characters, I realized if the books were about gender, we would discuss identity and tolerance. Other times if the story just happened to have a girl character, but gender wasn’t a central feature of the story, my scholars just wanted to focus on the great story and how the universal lessons applied to their lives. Two words: cool stories. Above all, if it’s a great story, it doesn’t matter who is on the cover. Everyone will want to sit up and participate. Pick contemporary and diverse stories. To continue to show the relevancy of the women’s movements and contributions of women to society, we owe it to all of our students to find more contemporary examples of women figures and showcase more diverse participants in equality. Let’s keep exposing our kids to women of today and of different backgrounds. Show explicit examples of men championing women. Boys need to see great role models of men advocating for women alongside or behind the scenes. There are plenty of men who have been in the trenches with women fighting for social justice and as invested in their wives, daughters, sisters, and mothers achieving great success in a field of study as the women themselves. If we want future generations of men to respect and support women, we need to offer boys examples of how to recognize and champion women’s contributions. Boys and girls need to see that the struggles for equality impacted everyone and were not about one group’s success at the other’s detriment. Talk about the universal lesson and character traits. Everyone can learn from a story about overcoming obstacles, persistence, and courage. Women like Wangari Maathai and Pura Belpré fought for what they loved and believed was right first, and then fought for who they were and who they represented. 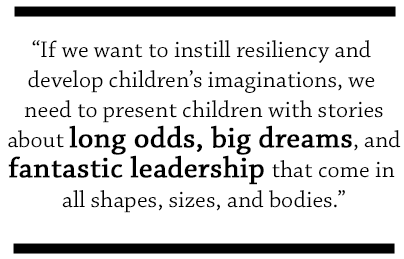 If we want to instill resiliency and develop children’s imaginations, we need to present children with stories about long odds, big dreams, and fantastic leadership that come in all shapes, sizes, and bodies. Throughout the year and especially during Women’s History Month, we need to teach that gender shouldn’t be an excuse to bar someone from exploring or contributing to a field of study. Concurrently, we want to show all students that gender can offer a unique perspective or approach that should be recognized and celebrated. Alongside our girls, boys need the language of equality and a broader view of history. Women’s contributions advanced our society and continue to impact all of us. We need to teach that gender totally does matter and, at the same time, totally doesn’t matter. Susan B. Anthony Is Great, But Who Else Do We Have? Here are books about high-achieving women from diverse backgrounds with diverse pursuits.